Blondies have more fun and this recipe is no exception! First, preheat your oven to 350 degrees (F)! Grab a large mixing bowl (give yourself enough room if you're using a mixer). Start by combining the Keto Meal, stevia, and baking soda. Add in your eggs, peanut butter, vanilla, and almond milk. The first few stirs are a little hard while trying to incorporate the peanut butter, but it gets easy pretty quickly! 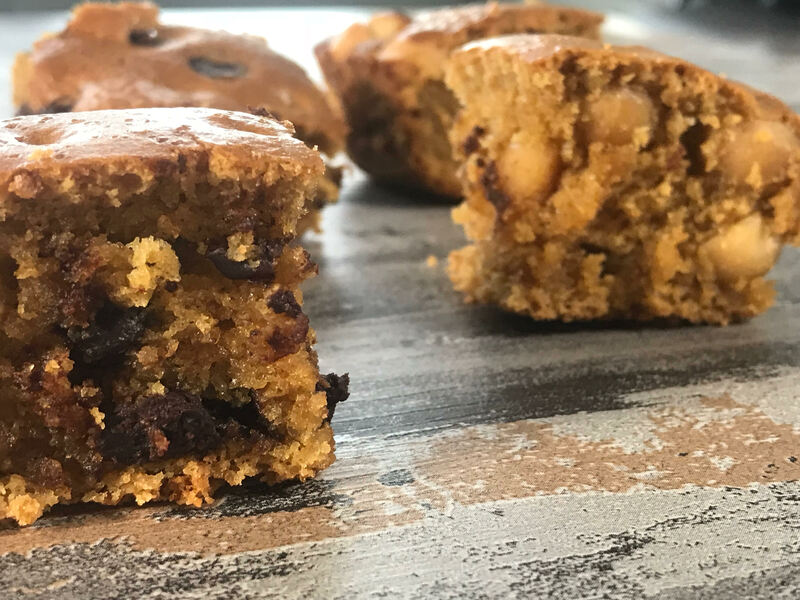 Now you need to decide whether you want these to be chocolate chip peanut butter blondies or macadamia nut peanut butter blondies. It's decisions like these that make life difficult sometimes (which is why I often opt to do half and half because why not?). Once you decide (or don't... hehe), pour your batter into your baking dish. Give it a little help evenly distributing it. From here, take your topping(s) and sprinkle them over your pan. You can leave them to just be toppings, or you can take a spoon/knife/cooking utensil and swirl them to incorporate them into your blondies. Now you're ready to bake! Let the blondies bake for around 25-30 minutes. The top cooks more quickly than the bottom, so either keep a close eye on it or I suggest that you may even want to move your oven tray down a rack! Allow them to cool for 10-15 minutes. This allows the blondies to firm up a bit and, I feel, taste the best. I hope you love them as much and our team and I do!